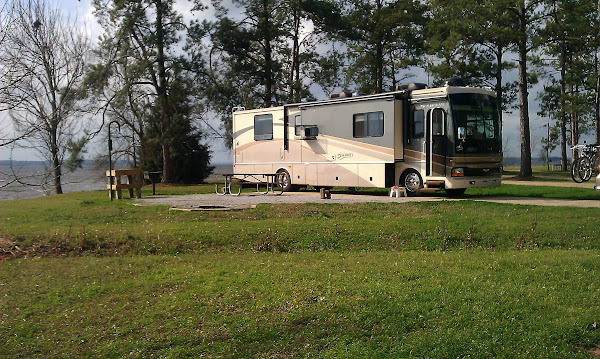 Home→RV Park Reviews→Georgia→Bye Bye Williston, FL! 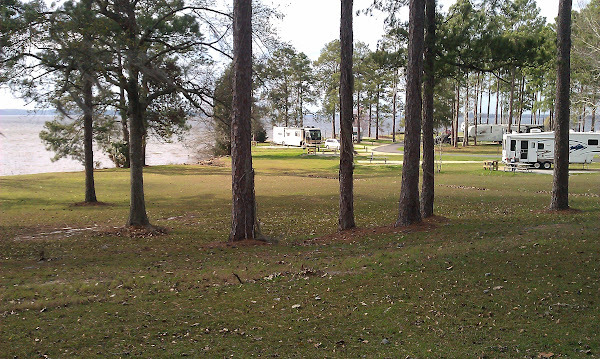 Hello Bainbridge, GA! Bye Bye Williston, FL! 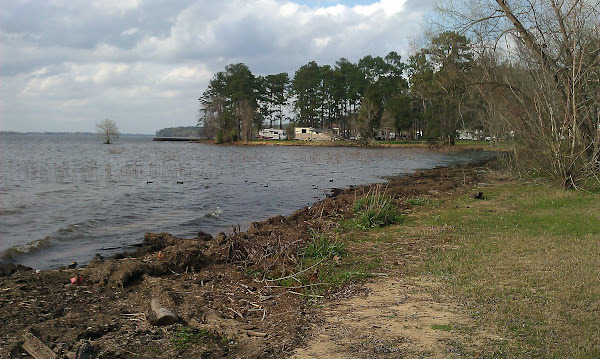 Hello Bainbridge, GA! After making preparations to leave Thursday morning, we walked over to Sue and Tim’s site to say goodbye and give them our contact information. We chatted with them (and Bob & Dean and the pooches) for a bit and were given a tour of their coach (a Fleetwood Revolution which was very nice). Since a possible plan for our trip back north is via I-65 which will eventually take us through Indianapolis, they suggested we contact them when we are in the area. Hopefully our schedule will work out so that we can do that. If not, maybe we’ll see each other again at Williston next winter! Our route was via SR121 (the same scenic route we took to Gainesville) to I-75 north and then I-10 westbound to exit 166. It had rained most of the night and was still pretty overcast and gloomy in the morning with intermittent quick showers during the entire trip. Traffic on I-75 was a little congested – lots of 18 wheelers but was three lanes so no issues. I-10 was a little less congested and is 2 lanes for this stretch. 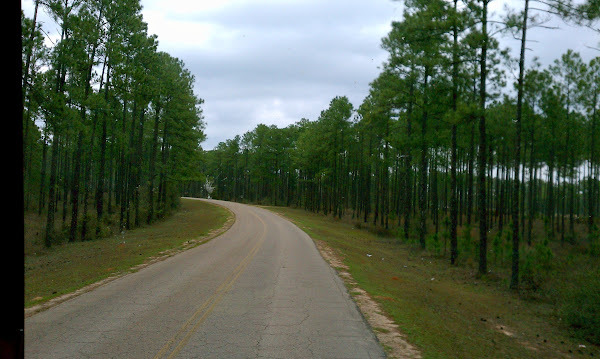 The terrain on I-75 and I-10 consists of gentle rolling hills thru pasture land and pine forests. Some of the hills are steep enough to cause the Allison 3000 to downshift on the uphill side. 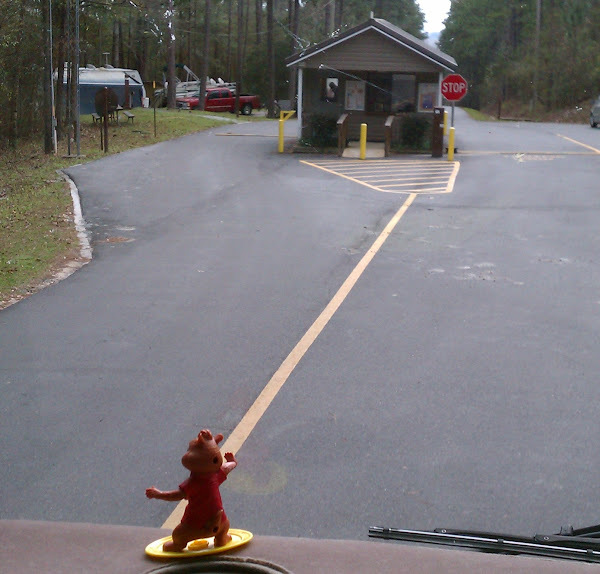 We took exit 166 and headed north on CR270A, then took a right on CR269, following that for 4 miles to a left on Highway 90 in Chattahoochee, FL. We then took a right on to Bolivar Street at the first light. After 1 mile we turned left onto East Bank Road. All these roads are in good shape but are a little twisty and hilly and seem narrow since in many cases there is no shoulder. A little spooky with an 18 wheeler coming the other way! If you come to Eastbank DO NOT let your GPS direct you for the final stretch after exiting I-10 – it will almost certainly lead you astray – even if you have entered the Lat/Lon. Our Garmin was way off, although Google Maps Navigation was much better. In any case just follow just follow the signs – and/or directions on the web site – it is well marked. 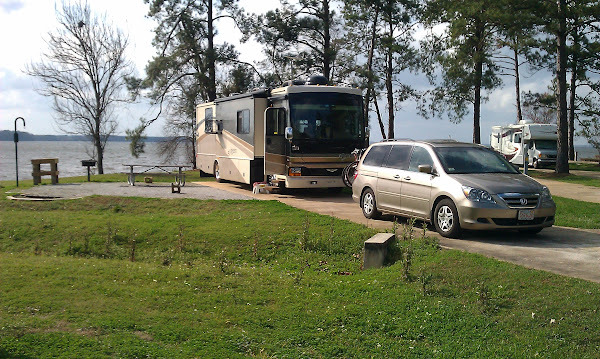 We arrived at East Bank around 1:00 p.m. We were a little concerned because there was a severe wind advisory in the area beginning around noon until 9:00 p.m. Luckily it wasn’t bad while we were driving but it is very gusty here at our site. There are whitecaps on the lake and with gusts up to 40 m/h small craft warnings are likely in effect. That’s us at the end of the road in the photo to the right. 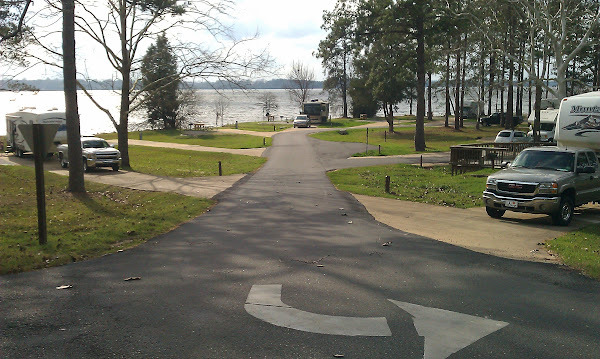 East Bank Campground is located on Lake Seminole near the Jim Woodruff Dam and is managed by the Army Corps of Engineers. It has 64 sites with only water and electric hookups but there is a dump station as well . There aren’t a lot of amenities but it is a lovely, very relaxing place to stay. We stayed here last winter and enjoyed it so much that we felt it was worth a return visit. One of the reasons we like it besides it’s serene beauty is the low cost, only $22 per night but with a National Park Senior Pass, it is only $11. You can’t beat that! 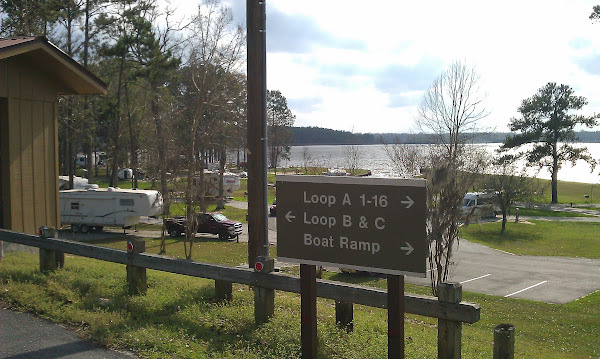 There are three loops in the campground, A, B and C. The sites on the A & C loops are right on the lake with many direct waterfront, while the B loop is towards the back of the campground and is away from the water. I don’t think there is a bad site here, although some may be preferable depending on your particular likes. 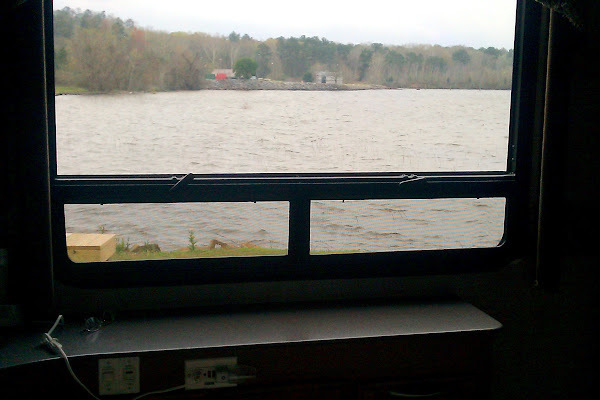 The photo to the right is the view out our bedroom window. Oh and just note that after you check in at the gatehouse and start the trip to your site you will be greeted by a long fairly steep hill down to the water. This is not a problem but make sure your brakes are in good working order! 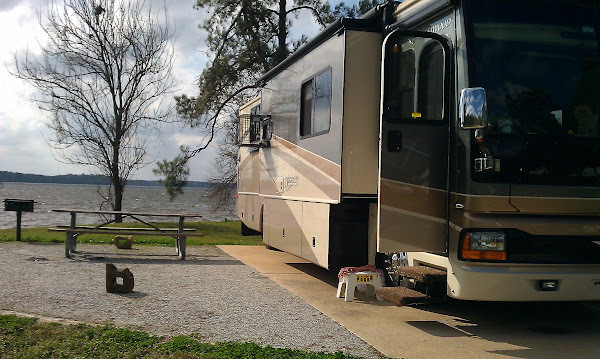 Most sites have 50A, water, a picnic table, a fire pit with grilling grate, a charcoal grill, a fish hanging pole and a fish cleaning or utility table. Some of the sites have full concrete slabs for your rig, while others are packed gravel or crushed asphalt. Voltage was great at 122v on both legs of the 50A. OTA TV reception is fair- we were able to get ABC/CBS/NBC reliably. Satellite would be no problem here as the tree cover is not extremely heavy, but your best bet would probably be the A-loop if that’s a concern for you. Sprint 3G coverage is good (2-4 bars) with decent performance. Verizon 3G is not quite as good but works OK.
Last year we were on waterfront site A-4 which was great but this year we reserved site C-31 which is also waterfront, has a concrete pad and gives us a direct view of the lake from the passenger side of the coach – the only possible downside of this site is that it’s a bit close to the firepit on the adjacent site and if a fire were roaring and the wind were out of the south it might be a problem. We actually wanted C-24 which is a concrete pad pull thru with good privacy and direct waterfront, but it was already reserved. More detailed information, a map of the campground and reservations for a specific site can be made at the recreation.gov website. Google maps also has good aerial images that may help you pick out a great site. In the image below the A loop is at the top left, the C loop the bottom left and the B loop on the right.